As a child – like so many children – I was afraid of the dark. In those long nights when I was stubbornly holding my eyes open against the threatening gloom, my mum would read to me from Martin Waddell’s Can’t You Sleep, Little Bear? In the book, Little Bear doesn’t like the dark. To Big Bear’s exasperation, he won’t go to sleep at night. What is he afraid of? Big Bear asks, again and again. “The dark all around us,” he replies. In the Night Time (Before the Sun Rises) unfolds a little like a storybook. Even its title has a fairytale ring to it. Once upon a time, Man and Woman (nameless urban archetypes) meet. On the street, maybe, or in a bar. They go on dates. He tells bad jokes. They fall in love. And then they have a baby. 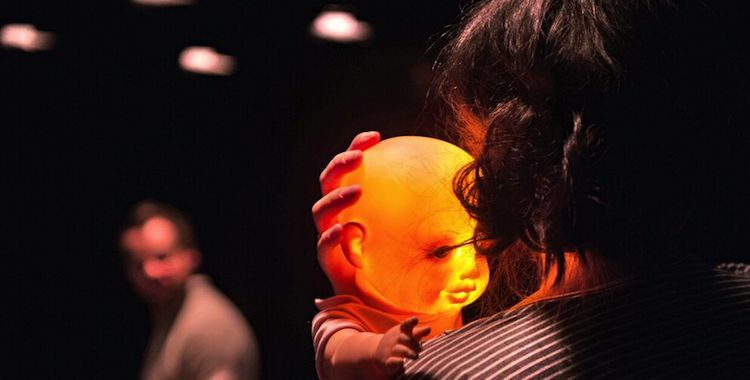 A child is born – though, Nina Segal’s play insists, this isn’t a religious story. This child is just another child. And like so many children, it cries. The newborn bawls ceaselessly through the night, driving its parents to distraction. We join them in one narrow, dark sliver of one of these sleepless nights, as fatigued desperation gives way to hallucinatory fears. Slowly, inexorably, all the terrible things happening elsewhere in the world seep through the four thin, brittle walls of the child’s bedroom. The two sleep-deprived protagonists are at once specific and generic. They’re both invested with just enough personality that we feel we know them a bit (she believes marriage is a misogynistic institution, he smokes though he knows he shouldn’t), yet they remain blank enough for us as audience members to project something of ourselves onto them. A bit like characters in storybooks. Segal’s dialogue oscillates between third and first person, while performers Alex Waldmann and Adelle Leonce always seem to be both in and out of character at the same time, flickering constantly between narrating and representing. It feels vital that they don’t ever become too particular, too easy to dismiss. This is not just about them, in the same way that fairytales are never just about Cinderella or Sleeping Beauty. This is for all of us who have brought or will bring or might bring another human being into this world. This incredible, broken, fucked-up world. As a teenager, I devoured dystopian fiction. I wasn’t alone. Dystopias seem to strike a chord with those trapped, awkwardly, between childhood and adulthood – perhaps, as Laura Miller suggests in the New Yorker, because “the typical arc of the dystopian narrative mirrors the course of adolescent disaffection”. In all those scorched worlds, seemingly far removed from the one I was growing up in, I found something to identify with. Those imagined apocalypses, though, have never quite receded as I’ve got older. They remain, somewhere in my own personal store of fears, multiplied by the threats of climate change, terrorism, mutating viruses. The dark all around us. In Blasted, a war zone explodes into a Leeds hotel room, violence tearing through Western comfort and complacency. Though In the Night Time owes a considerable debt to Sarah Kane’s play, here the domestic chaos of the child’s bedroom is never completely ruptured by the horrors beyond its walls. Instead they intrude and then recede, and then intrude and recede again. It’s a small space, the stage at the Gate, and director Ben Kidd exploits that. It easily becomes one of the too-small rented flats that families squeeze into across this city, filled with accumulating stuff. At the start of the show, the two characters and all the detritus of their lives are wrapped up in clingfilm. Tearing through this plastic membrane, birthed into the performance space, Waldmann and Leonce begin to construct the fragile lives of their characters. A picture frame here, a string of fairy lights there. All the things that we invest with the meaning of a relationship. With a child, of course, comes more stuff. Even the baby itself, a plastic doll with a flashing alarm in its head, arrives in an Amazon box. And littered with all the familiar junk of infancy – nappies and bottles and plastic, so much plastic – the stage already begins to take on a disordered, calamity-hit aesthetic, while the two parents circle one another like enemies in a war of their own. All it then takes to bring fears of conflict, crisis and disease crashing into the room is for this precariously constructed space to collapse entirely, possessions flying like shrapnel. “The two things are not connected,” the characters repeat again and again about different events – an insistent and increasingly desperate refrain. Of course, it only reinforces the reality that they are. Somewhere, far away, people are dying. Here, in a rented flat in an overpriced city, parents are placating their screaming child with “plastic sacrifices”. The two things are connected. Comfort in one part of the world depends on suffering elsewhere. This pervasive, unsettling fear is what reverberates through Escaped Alone, Caryl Churchill’s latest, compellingly strange play at the Royal Court, and it’s also what reverberates through In the Night Time. The Man and Woman feel acutely that imminent destruction is everywhere around them, but they feel powerless to fix whatever it is that has broken. Catastrophe and everyday life, meanwhile, are so closely knitted together that neither can overcome the other. The war zone never obliterates the child’s bedroom. The end of the world is both there and not there. The apocalypse isn’t coming. It’s always with us. As an adult, inching ever closer to 30, it starts to feel as though babies are everywhere. Facebook is suddenly full of them: a whole timeline of chubby cheeks and dimpled smiles. Female friends without kids begin, for the first time, to plan their lives within a slim reproductive window. At the same time, news headlines seem to scream the foolishness of bringing a child into a world fraught with so much violence and crisis and pain. Still, there’s only so much time, the world keeps reminding us. Tick tock. Better make your mind up. Duncan Macmillan’s Lungs cleverly stretched out one couple’s conversation about whether or not to bring a child into the world, revealing how a private decision is also one of agonisingly public responsibility. What justification can there possibly be for placing another carbon footprint on an already overburdened planet? In the Night Time is, in some ways, the “after” version of that play. This couple have already had a child – “for all the right reasons,” they assure us – but are left wondering if in fact they’ve made a terrible mistake. Both play and production occasionally strain this point. The repetitive rhythms of the play’s speech are apt, echoing both storybook narrative convention and the circular arguments of denial that so often greet situations of crisis, but they can also begin to grate. After the first wave of chaos, meanwhile, the staging gives itself few places to go. Waldmann and Leonce must simply pick their way through the plastic rubble of the set, an image that gradually loses its power as the piece goes on and the momentum begins to slow. With the exception of a tinny chorus of toy sounds, playfully reinforcing the ridiculousness of this plastic shrine the two characters have erected to their child, the second half of Kidd’s production never quite matches up to the first. In its evocation of present anxieties, though, In the Night Time is pretty damn potent. I might not have a child of my own, or be thinking about bringing one into the world any time soon. But those fears, that feeling that we inhabit a broken world and that – even worse – we are all selfishly failing to fix it, get me right between the ribs. Segal and Kidd manage to create the uneasy feeling that apocalypse is always right round the corner and that we as flawed human beings are each at once responsible and helpless. In the end, the show suggests, all we can really do is confront that dark all around us, waiting and hoping for the dawn to break.